Rohana Beddage is immortalized as an artiste who endeared himself to local music fans by knotting a novel twist to folk tunes and verse. His vision of leaving a legacy to future generations is enacted by his mission of delving deeply into social situations. Matrimony blessed him when he met similarly artistic Padmathilaka while acting in W.B. Makuloluwa's play Depano. 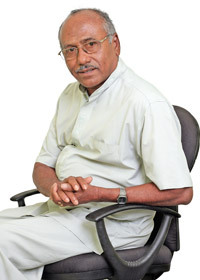 He directed music in stage plays Gajaman Puwatha and Madura Javanika, produced the children's play Alakanchiya and authored Gammanen Upan Geetha, Sinhala Sangeetha Shialiya and Loku Ayata Punchi Kathandara. In the following interview with the Daily News, Beddage asserts his convictions expressed on media time and again. Q: What are your current artistic activities? A: They happen only when I have the time. I run my Sandagiripaya Kalayathanaya in Horana, with music, dancing, drama and video technology courses. My new songs Gon Wassa and Mansiyata Kavi Seepada on Sasanda CD are hardly heard on media channels. They prefer to play my old songs than the new ones. Q: The Mamai-Benai stage performances you did with artiste Bandula Wijeweera showcased the humour in rustic lives. A: Than being jovial, Mamai-Benai songs are satirical. I try to point out social flaws without jeering at society. My lyrics created some new proverbs. The song Nanda Mama Denna Bahak Nodi Denna Depatte tells about a prospective bride's parents not coming to an agreement, with the result that their daughter becomes an old maid. This home division is like the Government and the opposition. If they do not come to a consensual agreement, the Government cannot solve the problems of people. 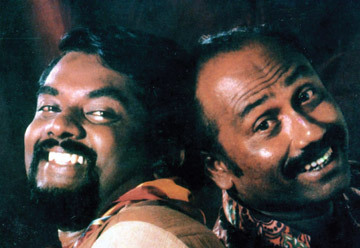 The song Raigamayai-Gampalayai says that the turned page is better. People side with the winning party for personal benefits and the country does not prosper. I write songs for the future generations. (I build the road, you pour the tar). In 1974, a song of mine predicted of obtaining oil from Pesale and fuelling our vehicles. Critics do not evaluate my songs and make use of the irony. I just sit back and do not feel upset about it. Q: Weren't you a radical breeze in the Sinhala music scene using folk poetry and melodies? A: Familiarity with folk literature makes villagers understand my lyrics. The intelligentsia do not accept folk literature much but that is where our tradition-based identity lies. Through this identity, we can develop, parallel with the world. My first song Mage Rattaran Helena was aired a lot on radio. A folksy tune differing from tradition was the secret of its popularity. What people understood as a difference was their ignorance of our identity. I applied the metre of folk poetry to create something different. Q: As in other countries, does Sri Lanka have a foundation of ethnomusicology? A: No. Like parrots, we intone what our teachers tell us and do not do a new thing. When pupils become teachers, they do the same thing. Teachers of folk literature are not flexible but villagers are free to play with literature, keeping their roots intact. Director of Education (Music) W. B. Makuloluwa researched into folk music and people are still doing the same thing that he did. With my songs such as Ranmali, I developed from where he left, which brought a tear to his eyes. Q: You said our folk music did not develop because we did not have tonic instruments with notations? A: Yes. Like in China and Indonesia, Sri Lanka has its own scale which is different from the piano scale. We have not studied it. Q: You do not agree that music is a universal language? Indian music and judge it in terms of Western music or some other system will mean missing the point and reaching absurd conclusions. It will be like judging Beethoven or Brahm in terms of Raga (the basic of Indian melodies) and Thala (the basic of Indian rhythm). The question of style or interpretation of finer and subtler points of execution cannot be discussed in any recognicable international terms. Aesthetic attitudes can. All this talk of music being an universal language is a facile over-simplification. I have heard a great deal of Indonesian, Japanese, Javanese, Persian, Arabic and Chinese music, not to mention the various national systems of Europe and I doubt if these constitute an international language." When the British first heard India's Raga-based music, they thought that Indians had a hearing defect as it differed from the piano scale. As they listned more, they realised it was a different kind of music. Q: What were you trying to say when you played Geta Beraya to a dance of Micheal Jackson on Rupavahini? A: Rhythm is common to all and can be applied anywhere. (Notations are different.) I can drum for any dancing anywhere in the world. Q: You said there is rap in local folk music. A: We have saudam in Thovils where the exorcist shows his prowess in front of the sick to receive gifts. He recites and does not sing. That is rap. We had this type of sahali from early times. Q: Your Sasanda song was featured on Los Angeles World Chart Show. A: Sirasa sent the song in 1996. It went into the top 20 and was the only song selected from Asia. During that year, the song was played in 240 countries. I am not aware of the royalty and do not mind someone else becoming rich. I stay the way I am and have no jealousy. Q: You have written much about Sinhala traditions. A: In village life there are ethics and traditions. One is removing your cap when you enter a house. Today's youth even sits in class or goes to temple wearing the cap. When a farmer stops work in the field to have lunch, he removes his turban as a respect for food. The new generaton does not know the ethics related to these traditions. I do not allow any one to enter my house wearing a cap. Q: What are your views on today's music scene? A: I am glad that the youth is experimenting with old songs. Rather than opposing it, we should point out defects. Their creativity in western trends outweighs flaws. Some of our musicians, trapped in their own knowledge, do not respect what is outside their purview. I was criticsed for singing two lines in a Bhathiya-Santhush number. The hostility was against the duo and not the song. Q: Do you teach music and dance to Sri Lankan students overseas? A: United Sri Lanka Association in New Zealand asked me to teach Sinhala culture to about 100 expatriate students there. For three months, I taught them of ethics, traditions, partaking of food, worshipping parents and other finer points of spiritual development. It climaxed with a four hour show of lullabyes, pantheru, lee keli and the stage play Parassaa. It was an amazing experience for the Prime Minister Helen Clarke, taken to the show in a procession. "He is a lovely person who helped my artisitic career with no reservations and changed its shape. He is a man complete in every way. Lyrics come to his mind and he creates tunes and directs music. He is also an actor, dancer, drummer and a writer of books on music. In a January felicitation of Beddage at Elphinston Theatre, Somaweera Senanayake spoke of him as a 'cultural ambassador'." Wijeweera first came to know Beddge while the latter was directing music in Dayananda Gunawardena's stage play Nari Bena while the former auditioned for the role of the fox son-in-law. 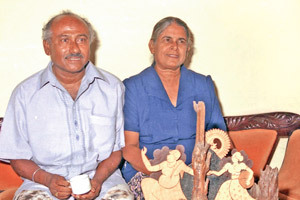 Ultimately, Wijeweera became Bena to Beddage's Mama in the popular stage act Maamai-Benai (father-in-law/son-in-law). "One song is linked to the other in dialogue as links in a golden chain," is how Prof Sunil Ariyaratne described the performance.